Montoursville Head Coach Jeremy Eck celebrates with his team outside the field after their win over Loyalsock in ten innings. Eck was ejected from the game in the ninth inning. SOUTH CENTRE TOWNSHIP — Gabe Phillips cannot run these days. His hamstring will not let him. So as Phillips walked toward first base, his teammates ran toward him … and Jaxon Dalena. Then all the Montoursville players piled on each other and celebrated one of the most exciting, intense and best District 4 Class AAA championship games ever played. Under the lights, in front of a boisterous, overflowing crowd, Montoursville officially announced that it is back. The Warriors are the new District 4 Class AAA kings. Owen Kiess threw three brilliant shutout innings of relief, leaving a runner stranded at third in the 10th inning, Cameron Wood hit a game-tying, sixth-inning double and Phillips drew a walk-off walk Wednesday at Don Engel Field as Montoursville edged Loyalsock, 3-2 in 10 innings and captured the District 4 Class AAA championship. Montoursville (17-2) also won the Backyard Brawl championship, receiving two trophies afterward, secured its 12th straight win and won its first district title since 2010. Up next is a state tournament game Monday against District 2 champion Lakeland at a District 2 site. The Warriors and their army of fans might need some oxygen first. Eck coached Loyalsock to four district championships and two state titles before resigning following the 2016 season. He returned to his alma mater this season and convinced a young Montoursville team that it could do great things. Eck was ejected in the 10th inning arguing a check-swing called strike, but his team validated the confidence he expressed in them the day he was hired. Montoursville rallied from a 2-0 sixth-inning deficit, did not flinch after Anthony Pastore worked out of a bases-loaded, no-out jam in the eighth and worked its way past a dynasty, denying Loyalsock (16-4) a second straight and its eighth district championship since 2008. Loyalsock has plenty to feel good about, nearly winning another championship and ending its season by winning 14 of its last 16 games. Logan Edmonds and Pastore combined on a 5-hitter and Pastore started overpowering Montoursville after he induced two fielder’s choices to himself and struck out a batter to end the eighth-inning threat. He retired seven straight after recording a strikeout to start the 10th before Dalena walked. Ryan Kessler (2 for 3) followed with a walk and Wood hit an infield single. Montoursville then called on Phillips, who has missed nearly half the season battling an upper hamstring injury. 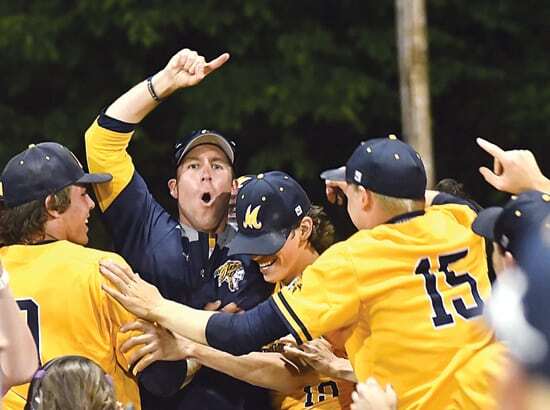 Phillips never had a chance to channel his inner-Kirk Gibson but, by not swinging the bat, he gave Montoursville its biggest win this decade. 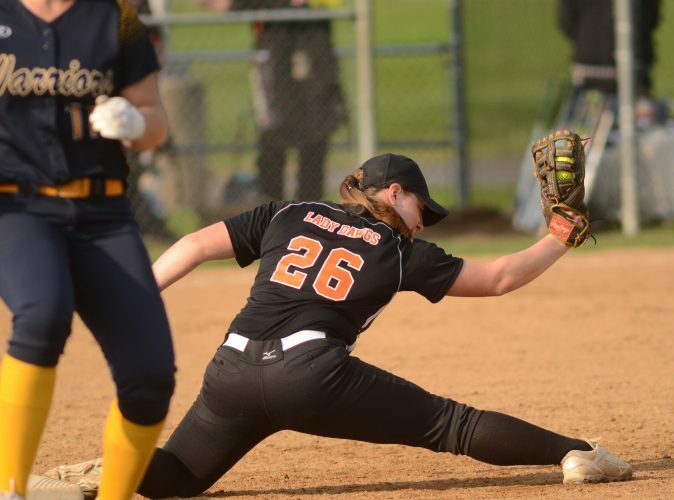 Phillips watched four straight balls go by and when the final one sailed just wide, Montoursville had that elusive championship. Parents and fans flooded the field afterward, congratulating players who never buckled under the most intense pressure. Edmonds dazzled for five innings, allowing just two hits and striking out six. RBI singles from Connor Watkins and Derek Gee in the third and fourth innings had Loyalsock up, 2-0. Edmonds did not allow a run in his last two playoff starts a year ago and that two-run lead seemed larger as the sun started setting in the west and on Montoursville’s season. Kiess, though, sparked a comeback. He ripped what looked like a lead-off single that hit off the third-base bag. He never broke stride and stretched it into a double, lighting a fire that never was extinguished. 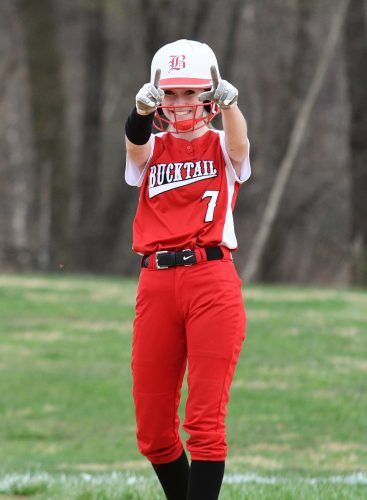 Dalena’s RBI grounder made it 2-1 and Kessler drew a two-out walk, setting the stage for Wood. Wood hit a walk-off single as a 12-year-old that once helped Montoursville win a Section 3 championship. That hit is now second on his all-time favorite list. Wood slammed an 0-1 pitch into the left-center field gap as Kessler scored and tied the game. Wood was pinch-run for and a horde of happy Warrior teammates greeted him as he approached the dugout. After Pastore ended the eighth-inning Montoursville threat, it looked like he might help Loyalsock take a 10th inning lead. Mitch Klingerman hit a lead-off single but third baseman John McCarthy made a super play on Pastore’s attempted sacrifice bunt and threw out Klingerman at second. Pastore was nearly picked off by Kiess and was caught in a rundown. In the most controversial call of the night, in a game filled with controversial and questionable decisions, Pastore was called out and then ruled safe running into second base. During the confusion and ensuing argument, Pastore hustled into third. When there was no margin for error, Kiess may have never been better than he was after that sequence. He recorded a strikeout for the second out before intentionally walking Hunter Webb and Connor Watkins, setting up a force at any base. The senior leader who won a district basketball championship last winter, then struck out Edmonds on three straight pitches, blowing a high fastball by for strike three. Ott did a good job doing the same thing. The left-hander threw a no-hitter in Saturday’s semifinals, but Loyalsock produced a season-high seven hits off him in the first four innings. The sophomore minimized that damage, preventing Loyalsock from landing a knockout blow, then settled in and dominated his final three innings, finishing with 11 strikeouts and closing out his performance by striking out the side in the seventh. Ott also was batting in the 10th inning when Eck was ejected. Both teams had been victims of controversial, and often incorrect calls, and when Ott only slightly moved his bat but a strike was called, Eck had seen enough. A half inning later, those players rewarded Eck and gave him his fifth district championship. And put an exclamation point on this comeback season. Logan Edmonds, Anthony Pastore (7) and Eric Holz. Logan Ott, Owen Kiess (8) and Jaxon Dalena. W–Kiess, (7-1). L–Pastore, (5-2). Top Loyalsock hitters: Dane Armson 2-4, R; Connor Watkins 1-4, RBI; Hunter Webb 1-3, 2 BB; Derek Gee 1-4, RBI; Mitch Klingerman 2-4, R. Top Montoursville hitters: Kiess 1-4, 2B, R; Cameron Wood 2-5, 2B, RBI; Ryan Kessler 2-3, 2 BB, R.
Records: Montoursville 17-2. Loyalsock 16-4. Next: Montoursville vs. Lakeland, Monday.